Some people like Android for its breadth of hardware options and strong app support, while others like Windows 10 Mobile for its Microsoft connections and Live Tile interface. With Android dominating smartphones with more than 85% global market share, it’s obvious that Google’s mobile OS is a popular choice. Samsung, apparently, has at least considered the possibility of giving you the best of both worlds with their recent patent of a dual-OS smartphone. Not only does this patented design run both Android and Windows, but it does so at the same time. As Sammobile.com reports, the device would enable switching between Android and Windows via the same mechanism as Samsung’s current Multi Window capability offered on many of their Galaxy smartphones. The patent application, filed in May 2015, shows how both operating systems can be displayed in two windows, enabling the user to drag and drop files between them. It is possible to minize one OS to a floating icon, in the same way an application can be minimized in the current TouchWiz UX. Pressing the Home button brings the user back to the Android home screen. Furthermore, resources can be managed by assigning processor cores and limiting memory usage per OS. Also, shared folders can be set, to provide access to files from both operating systems. 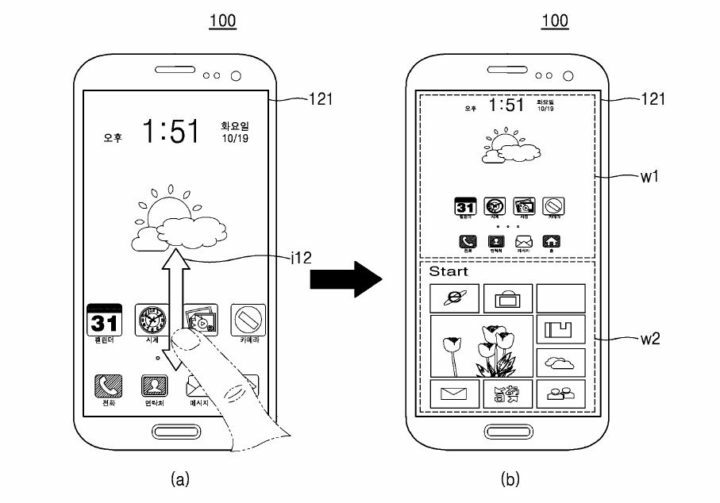 In Samsung’s patent, files can be shared between the two operating systems. Of course, more patents are filed than products are ever actually produced, and so there’s absolutely no guarantee that such a device would ever become available. In fact, we doubt that it will ever see the light of day. Nevertheless, it makes for a nice dream, as the ability to access the best of Android and Windows simultaneously would solve a great number of problems for a large segment of the smartphone user population. Let us know in the comments if you think such a device would be attractive. We’ll keep our fingers crossed and let you know if we come across anything new. Would you be interested in a smartphone that runs Android and Windows simultaneously?